Joan La Barbara has created more than 120 compositions throughout her career as a groundbreaking composer and performer, and she has worked with some of the most notable names in contemporary music. A pioneer of vocal exploration, she’s known for her remarkable and distinctive vocabulary of sounds and compelling sound experiments. Across her career her work contains an expansive range of diversity in its form, content, and presentation—driven, at least in part, by her infectious curiosity. La Barbara—along with fellow Merce Cunningham collaborators John King, David Behrman, Fast Forward, George Lewis, Ikue Mori, Zeena Parkins, Philip Selway, Quinta, and Christian Wolff—will perform at the Walker this week in Music for Merce, a two-day celebration honoring the important musical influence of Cunningham and his lifelong partner John Cage. Like Cunningham himself, La Barbara’s work demonstrates a deep appreciation and interest in other art forms. Whether it is working collaboratively with her contemporaries or taking inspiration from something seen in a gallery, she channels ideas from other mediums into her own work. In a recent interview, La Barbara spoke about some of these inspired works and reflected on the value of working beyond one discipline. I’ve done a series of works that I call sound paintings. Essentially, I tend to see sound when I make it, so a lot of my scores include graphics as well as musical notation (depending on what I need). If I need to communicate particular pitch information, then I’ll use musical notation. If what I’m interested in is more a kind of gesture—a sonic gesture—then oftentimes I’ll draw a graphic into the score. When I look at works of visual art, I stand, sometimes sit, and spend time with the painting. Whether it’s looking at its form, looking at color, or just absorbing what you’re getting from it… some people will walk closer to the painting to see details, some will walk back from it. I know Philip Guston felt there was a particular distance from a painting that was the “perfect” spot. I don’t know that we can all find that perfect spot, but each of us tries to understand a work of visual art by moving to it, moving away from it—looking at brushstrokes, looking at the thickness of the paint, as well as looking at the whole structure and construct of what we’re receiving. I look at a great deal of contemporary art, but I think it is very similar with classical works of art: you’re looking at structure; you’re looking at the hue, the particular color scheme that the painter used and why; you’re looking at how the painting is structured. We do similar things when we listen to music (and sometimes when we perform): we will sometimes listen for melody, we will sometimes listen for the expertise of the musicians playing the work—so we listen to things in different ways just as we look at paintings in different ways. And sometimes we’ll sit there and let it wash over us. We’ll sit there and have an experience. I think composers like Bach and Morton Feldman are very much like that; you’re listening to a kind of overall experience and sometimes then you’re also listening to detail. These are the things I think we have in common when we experience a work of visual art and when we experience a work of music. There have been several [of my sound paintings] inspired by very specific paintings, like the [Paul] Klee painting that I was inspired by was a work called Hauptweg und Nebenwege (Highways and Byways). What I try to do when I’m inspired by a particular work of art… it’s not exactly translating, but it’s expressing what I feel in experiencing the work of art, using the tools I have—my musical tools. With Klee Alee, what I saw was almost like a wall of color blocks, so what I created on multi-track tapes (I was working on analogue tapes at that time, but it could also done be easily in digital) was what I considered to be blocks of sound. The painting has a lot of blues and greens in it, so I was altering the vocal sound that I was making to create a kind of sound that I would consider blue or green. Not that I necessarily see color when I see sound—some people who have perfect pitch actually see colors when they hear specific pitches—but what I was creating was a kind of color wall. What Klee had done was to paint very thickly onto the canvas, and then obviously he used a sort of sharp tool to etch into the thickness of the paint. I then used a different vocal technique to, as it were, “etch” into the vocal sound blocks that I had previously made. So in a work like that I’m using a very specific technique and building a sonic painting based on an actual visual painting. In other cases, I’m dealing more abstractly and I create sound paintings that I want people to experience in the way they come and look at a work of art. [In these works] what I’m doing as the composer is to record all of the material that I want and then, in the mix (in post-production), I go in and I will mix it, edit it, layer it, so that I’m drawing the listener’s ear to a particular aspect of the overall work. In other words, I’m directing where you stand and look at the painting—I’m directing what you are actually hearing, very specifically. With that what I’ve tried to do is to create…I won’t say stasis, but I create a work where everything exists from the very first moment to the last moment. Where there’s nothing like development. It is all of the sound material that I use in that particular work, then what I do is bring certain elements forward and bring other elements into the background. So I’m directing how you hear that work. 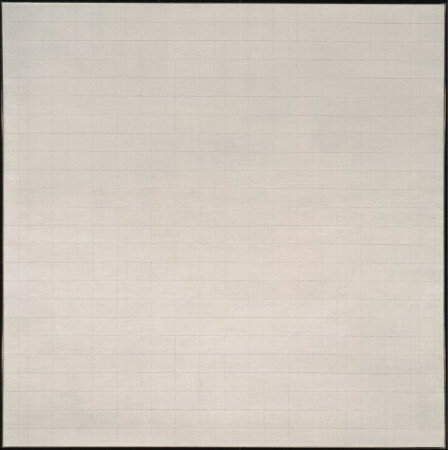 I first saw [Agnes Martin‘s] work in around 1976. I was doing a concert in northern Italy for a gallerist, and he had some of her works. [They were] small, sometimes graphite on canvas work, and I was just completely overwhelmed with the simplicity, the focus, the kind of quiet energy that was in those works. Sometime later I picked up a catalogue that had a lot of those works in it— works from the sixties. A lot of them are very, very simple—just lines. I wouldn’t exactly call them grids, but just a lot of horizontal lines. Very, very thin, sometimes painted on canvas, sometimes graphite and paint. I wanted to do a work that was inspired by those paintings in particular, and it seemed to me that it would be a wonderful work to do with orchestra, because the orchestra is so vast in its potential but it also has the ability to make very fine, very intricate sounds—which is what I felt about her paintings and her work. She had the ability to do very large works, but she also had the ability to focus into this very delicate work. It took quite a while, but in 2010 I was commissioned by the American Composers Orchestra to write a work (they were doing a series of concerts of nontraditional orchestra works), and what I wanted to do for this piece was to place the musicians around the audience—and actually place some of the them in the audience—so that the audience was actually in the center of the orchestral sound. A lot of times visual artists will prepare the canvas by putting a wash of some sort over the canvas, so what I did was prepare a kind of wash of sound. [In addition to the musicians] I had audio speakers around the audience, and the wash consisted of breath sounds from the voice, instrumentalists breathing into their instruments, the pianist just rubbing his open palms over the strings inside the instrument, and the harpist doing the same thing. It was a very airy, non-tonal sound, which is what I feel the wash is. Kind of a way of neutralizing the canvas, so that when you start to put whatever you put on it—whether it’s color, big splashes of color, or simple lines—that it goes onto the canvas in a certain way. [After I prepared the] wash, I added one instrument at a time—and I started with the string instruments (the violins)—they just played a single note, and I separated them out so you didn’t have a section. You had them as individual soloists, and they were around the sides of the concert hall. So back and forth you would get a kind of call and response of a single pitch, being drawn or played very very delicately. Essentially what I was doing was not only placing the audience inside the orchestra, but I was also placing the audience as if they were beneath the canvas, and that canvas was actually being drawn on in space above them. The idea was [to imitate] doing individual strokes on the canvas, and the technique that I used with strings is something called flautando, which means that they just very, very lightly draw the bow over the strings to create the note—non-vibrato—so it imitates in a way, in sound, what I felt she was doing with the graphite (or the ink, or oil, whichever it was). It had the delicacy. Gradually I began to create a very very minimal melodic line that developed, but the initial gestures were as close as I could get to these just very simple gestures on the canvas. I also have done “sounddances,” and they were very much influenced by the work of Merce Cunningham. 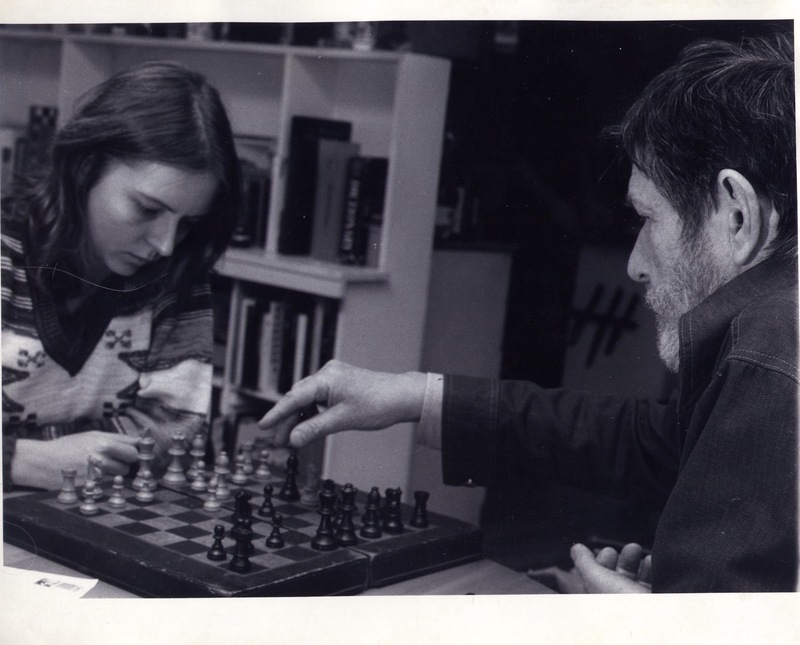 Because of my association with John Cage, I started working with the Cunningham company in the early ’70s [at the same time] I started working Cage. So I saw a lot of Cunningham dance over the years, and what struck me about Cunningham’s work is that as an audience member you make choices: you could look at individual dancers and the specific movements they were making, or you could take a wider view and look at everything that was going on and try to get a sense of the form. So again it’s this kind of large perspective as opposed to a detailed perspective. I was also fascinated with how Cunningham felt that whatever way the dancer was facing was forward. It didn’t matter whether they were facing upstage or downstage: wherever they were facing, they were performing their action. I thought of that as I mixed certain specific pieces. There’s a work of mine called Autumn Signal, and another work called quatre petites betes, and with each of them I thought of sound almost like characters—or dancers, or figures—and moved them around [as such]. In the case of both of these works they were done in quadraphonic sound (four speakers, around the audience), so I was able to move the sounds around. As one particular kind of sound is walking around the periphery, then different kinds of sounds were flying overhead. In the case of quatre petites betes I created a kind of clearing in a field with four little beasts, each of whom had their own language. They made their own particular statement, then countered each other and had this little battle in the middle of the field, and then flew off into the sonic atmosphere. So I don’t think traditionally as a composer. I really am very affected by different art forms, different mediums, and what I try to do is to try to use my interest and my fascination with different kinds of art—use my understanding of them, use my way of translating them—into a sound art. There are also pieces that I have done that are, let’s say, more traditional—that do start out with melodic ideas and then develop melodic ideas—but I’m influenced by a number of different things. I did a work called Awakenings for chamber ensemble that was inspired by the book by Oliver Sacks [of the same title], about the people who, during a flu epidemic, had fallen into a coma and were kept alive in a vegetative state. At some point their doctor used a particular medicine and it woke them up—unfortunately for only a limited period of time—and it was almost like a Rip Van Winkle thing, where they went to sleep in a particular time and woke up some 20 or 30 years later with the world having changed. They had to then experience the world that way, and then they gradually drifted back into the coma. In this work I’m using a phenomenon, a medical phenomenon, to inspire a musical work. And the way I translate it is by translating [their experience] into sound: starting from a kind of meditative or sleep state, to [moving to] a point of more discovery/energy/activity, and returning into this kind of solemn/calm/meditative state. It’s just a way of working… We could talk for hours about what inspires people: why one writes a certain kind of work. Wagner, he was enamored by Norse legends. Other composers work with texts or poetry, while opera composers deal with stories and how you tell that story both through voice and text and orchestration. I’ve done a number of collaborations with other artists, and they’ve been very different one from the next. I’ve done a lot of work with choreographers. In most cases it’s been more real-time, back-and-forth exchange. But, I worked with a filmmaker one time, Aleksandar Kostic, and we applied the Cage/Cunningham principle, where I said, “OK, we’re going to work for 30 minutes, and the name of the piece is Persistence of Memory.” We did not work out the form; the only thing that I did stipulate, since he oftentimes does a lot of realistic storytelling, is I said, “I don’t want realism in this”—that I would prefer it much more abstract. And I did say what I was dealing with are extremes of weather. Extreme events. I didn’t tell him specifically what I was dealing with, but I was dealing with avalanches, cyclones, and car crashes—events that would happen and then ricochet. We performed it in Berlin in 2012, at the opening of the Berliner Festspiele. We actually put it together, in the Cage/Cunningham tradition, in the dress rehearsal. I had my ensemble with me—the seven musicians of Ne(x)tworks—and he had the film. The film was simply projected and we performed. What was astonishing, which is something that happens very often in the Cage/Cunningham simultaneities, is that you get things happening that seem so absolutely right, seem absolutely to have to have been planned, but they weren’t. It’s a kind of magic, and I don’t know if it’s something that’s because of our perception that we deal with it that way, or if it’s this kind of magic [that happens] when two artistic collaborators are true to their own art form, their work flowing together in a remarkable way. Also, when I did an Events performance with the Cunningham company in ’76, there were a number of remarkable things that happened. Merce told me what the time was that we were dealing with, and I had planned several of my works accordingly. One of them was a work called Circular Song, which is for solo voice, inhaled and exhaled vocalizing. Just as a matter of coincidence, at the moment that I started Circular Song, Merce came out with a solo of his own. And it so remarkably mirrored the form and, for me, the shapes that he was making. It was one of those dances where he moves his foot forward and then part way back, and then another foot forward and part way back, and that mirrored for me the sound that I was making. 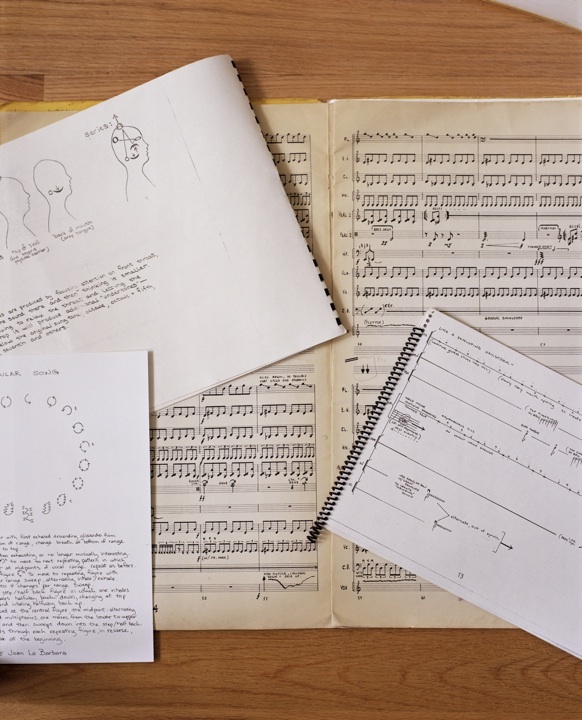 I also had a work of mine called Thunder [performed with Cunningham’s company]—which was for six tympani and voice with electronics—and the dancers told me afterwards that it was a really remarkable influence. The work that they were doing at that particular moment in time was Summerspace (which was originally done to very sparse and quiet music of Morton Feldman), and they said when they did it [with Feldman’s music] they were sort of fawns in a field or something, but when my work was played with the same dance it was more like a jungle, because my work was so much louder and more reactive. I’m working right now on developing an opera. It’s inspired by the work of Virginia Woolf and by Joseph Cornell—two very different artists, obviously one dealing with words one dealing with visuals. But Cornell also worked from his dreams and kept written journals, and Woolf said that she heard her work first as music and then translated it into text—so you know it’s just this is sort of an ongoing experience I have of working. And it will go on. Joan La Barbara will perform at the Walker Art Center on February 23 and 24, 2017, and at MCA Chicago, February 25 and 26, 2017 as part of Music for Merce: A Two-Night Celebration.